Welcome to the Brigantine schooner “BRITANNIA.” This is an ongoing account of the renovation and remodeling of a 1977 Down East sailboat. I’m Roger Hughes, an Englishman living near Orlando, Florida USA. BRITANNIA was the Roman name for Britain and also a mythical war godess. It has also been the name of a British ship for centuries. Britannia was a 100 gun ship of the line in Victory’s column at Trafalgar in 1805. It has also been the name of The Royal Yacht and a number of famous racing yachts. I was actually surprised to find the name still available in the Isle Of Man (UK) ship registry. So I grabbed it and am very proud to have it. My BRITANNIA is a proper ocean cruising yacht, forty five feet on deck, a six foot bowsprit and fourteen foot beam. She has a full length keel drawing six feet six and displacing some twenty three tons. The heavily built fiberglass hull also has simulated planking, causing some to ask if she is made of wood. She was built in 1978 at Santa Anna, California and in those days they made them strong. For those who don’t want to read all my scribblings, you can read an overview, reprinted from read here. I searched a long time for a schooner; and the reason I wanted a schooner was because I really wanted a Brigantine. 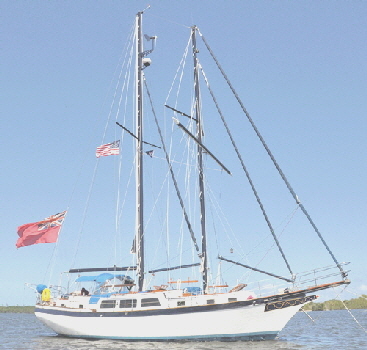 To me, a Brigantine is the ideal cruising rig, capable of hauling tolerably close to the wind with four fore and aft sails, (although not as high as with an 85hp engine), having fast reaching capabilities and unbelievable down wind stability using the square sail(s). Also, like a ketch, the sails are divided into smaller, manageable sizes. 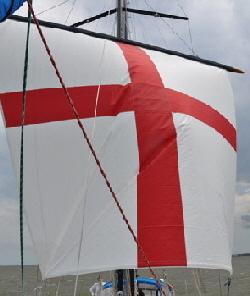 However, there is also a significant problem having a conventional square sail set on a yard high up a mast: That is, furling and unfurling the darn thing! This single issue precludes their use on all but large crewed vessels, like sail training ships, with lots of young people willing to scale the ratlines and edge out along the swaying footropes to release or claw the canvas onto the yard. It is a very dangerous operation, and men have fallen to their deaths from up there. But what if you could easily furl and unfurl a square sail from the safety of the cockpit, without a single person having to go aloft? I designed and built such a system which is an article published in magazine November 2015 and reprinted here..
After designing this system the next problem actually proved more difficult. I couldn't find a schooner the right size and price to mount the yard on. So I bought a ketch and converted it first to a schooner, then a brigantine. BRITANNIA is extremely heavily built, which is good for an ocean cruising yacht. But there were some things I didn't like about the inside layout, like the wash basin in the aft cabin instead of the bathroom; the large lazarette lockers considerably restricting space in the aft cabin bed; the 3/4 size bathtub neither one thing nor the other; only one shower and the scruffy little pump-out toilets. There was also no effective air conditioning system, which is a big problem in Florida in the summer. There were also many instances of design and construction, which, given a little more thought would have made the layout more convenient and workable. 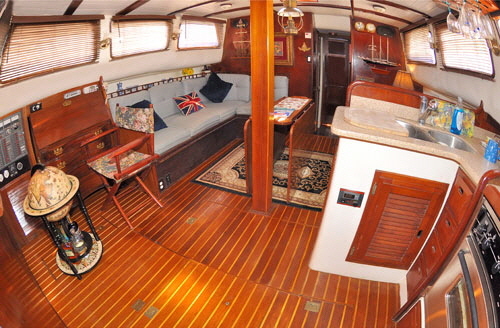 Like the port side cabin, the position of the saloon table and the humongous chart table. It was almost as though the designer and builders had very little practical sailing experience. I knew all these things could be altered-and most of them now have been. Their stories are told in these pages. Before you delve into the depths of this sometimes quite technical sailing site, I want to say I have tried to make it readable by yachtsmen and non-yachtsmen alike. Yachtsmen will have little difficulty with the terminology, although I have met some who don't know what a Fore Course is - some thought it was a golfing term. Therefore, for new sailors or landlubbers I have sometimes explained terms in a way which might make an experienced yachtsman wince. I hope you will forgive me for this. There is something else as well. People have expressed amazement at some of the alterations I have made to Britannia. The fact is though, I enjoy woodwork and seeing my modifications improve the boat overall. I have the skill and the tools, and also the time. As ratty said to mole, “Believe me, my young friend, there is nothing, absolutely nothing, half so much worth doing as simply messing about in boats. Simply messing about in boats, or with boats, in or out of em, it doesn't matter. Nothing seems really to matter, that's the charm of it.” Kenneth Grahame Wind in the Willows. PRINCIPAL SPECIFICATIONS: For individual items, see page navigations. Propeller: 20” x 18” bronze, three blade. Dinghy: Caribe RIB. 10’3” long x 5’6” beam, forward storage locker, anchor and chain, seat and storage bag. Outboar Motor: Tohatzu 6hb four stroke. Generator: Kubota diesel 6.5kw 120 VAC plus 12 volt charging. Ground Tackle: 60Lbs CQR main bower, 30Lbs CQR secondary, 250 ft of 3/8” chain. Stern anchor and chain. Accommodation: Queen bed in aft cabin, double in port cabin, double in fore-peak. Bathrooms: Aft; washbasin, toilet, full size bath/hot tub and shower. Fwd; washbasin, toilet, shower. Heads: Two electric with twin US Coast Guard approved waste treatment systems. fresh water or seawater flush. Air conditioning: Two 16,000 btu ducted hot/cold air handlers. Safety: Eight man ocean liferaft. Extinguishers in all rooms, Flares, Lifejackets. Batteries: Eight 240 amp hr 6 volt float cells in four banks of 12 volt. Also, Two 280 amp hr batteries dedicated for engine start and windlass. Bilge Pumps. Two Flojet Quad II diaphragm electric pumps, 5.0 gallons per minute. One Gator hand pump operated from the cockpit. Also an engine driven pump for emergencies.